This past weekend, millionaires, billionaires and every day fans of ultra exotic cars gathered in Pebble Beach, California for the annual Concourse d'Elegance. The Concourse d'Elegance is a world famous car show for both owners and enthusiasts of exotic and historically significant vehicles. The Concourse takes place every year over a weekend in August. Highlights of the weekend include an art show, driving events, motorcades and of course a world famous auction. At yesterday's auction, a rare 1967 convertible Ferrari 275 GTB N.A.R.T Spyder was sold for a mind boggling $27.5 million. The 1967 Ferrari 275 GTB N.A.R.T is one of the most highly sought after collector cars in the world because only 10 were originally manufactured. The cars were originally custom made for a single Ferrari dealer in America named Luigi Chinetti. Chinetti asked Enzo Ferrari personally to make a convertible version of the then-standard hardtop 275 GTB/4. 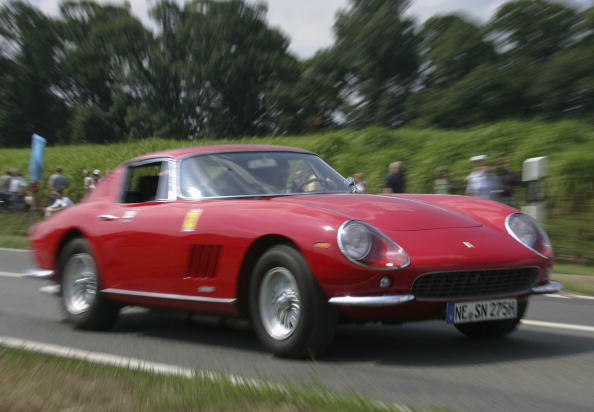 Enzo agreed and the "North American Racing Team" (N.A.R.T) 275 GTB Spyder was born. Initially, the plan was to manufacture 25 of the custom NART Spyders, but only 10 ended up making it off the factory lines in Maranello, Italy. Luigi Chinetti paid Ferrari $8000 for each of the 10 cars in 1967 and sold them for approximately $15,000 a piece. That's the inflation adjusted equivalent of $105,000 per car. Amazingly, the Ferrari that sold yesterday in Pebble Beach has only ever had one owner! In 1967, a North Carolina car collector named Eddie Smith Sr. purchased one of the 10 original NART's from Luigi Chinetti and even picked his car up directly from the Ferrari factory in Maranello. Eddie Smith, who died in 2007, has a rags to riches story that would make anyone tear up. He grew up an in an orphanage after both parents died in 1930. Smith left the orphanage after seven years when he was 17 to work as a taxi driver. Within a a few years he was managing the entire cab company before being wooed away to run a mail order company. Eventually, Smith launched his own company, National Wholesale. Over the next several decades, National Wholesale grew into one of the largest direct mail companies in America. Smith went on to be elected Mayor of Lexington, North Carolina in addition to raising millions for local charities. The combination of only having one owner for 45+ years and the car itself being incredibly rare, raised auction price expectations to the sky. Experts expected the car would bring in $14-17 million. So you can imagine everyone's amazement when the gavel finally landed on $27.5 million. The winning bid was submitted by Canadian fashion billionaire Lawrence Stroll. Stroll is worth $2.1 billion thanks to early investments in Michael Kors, Tommy Hilfiger and Karl Lagerfeld. Stroll and business partner Silas Chou are responsible for building the Tommy Hilfiger brand from relative obscurity to worldwide sensation in the 1990s. Today they still own the rights to Tommy Hilfiger Asia. He is an avid car collector and owns a garage that houses dozens of extremely rare exotics. That price makes yesterday's sale the third most expensive car ever sold at auction worldwide. It's the most expensive car ever auctioned in the United States. The second most expensive is a 1954 Mercedes W196 Formula One car that was sold a month ago in England for $29.6 million. The most expensive car of all time is still this Lime Green 1962 Ferrari 250 GTO that sold last June for $35 million in England. Seattle billionaire Craig McCaw could afford the $35 million price tag because he sold his cellular technology company McCaw Cellular to AT&t for $11.5 billion. The sale left Craig with a net worth of $2.1 billion after taxes which was eventually reduced to $1.6 billion after he lost $460 million in a divorce from wife Wendy. It was the fourth most expensive divorce of all time. So if you were a billionaire and could buy pretty much any car in the world, what would you choose? Instantly Become A World Class Ferrari Collector With This $11 Million "Starter Kit"
If each Ferrari in the Tony Shooshani Collection sells for the minimum estimated value, this collection would bring in over $11.5 million! You Might Put Photos Of Your Kids In Your Cubicle, This Guy Put Up A 1967 Ferrari... For 33 years! Ferrari, Porsche, Bugatti, Lamborghini, BMW... here's everything you need to know before you buy your dream car!